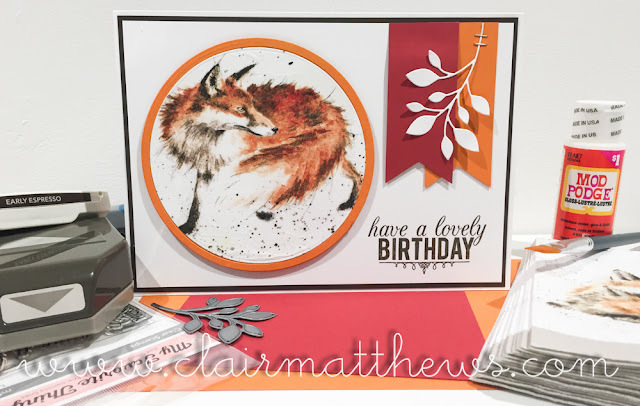 Clair Matthews: Workshop card 07.07.16..
...a couple of weeks ago my good friend mary showed me a beautiful cards she'd made using serviettes & mod podge. I know it sounds weird, but trust me it looked amazing! Mary kindly gave me permission to steal her idea & use it at workshops this week. so here's my attempt..
..we're using ModPodge for the first time! which is a super fun thing to try & it opens up many possibilities!! We're also using some new MFT stamps, lots of Stampin up products & one of my favourite little leaf dies.